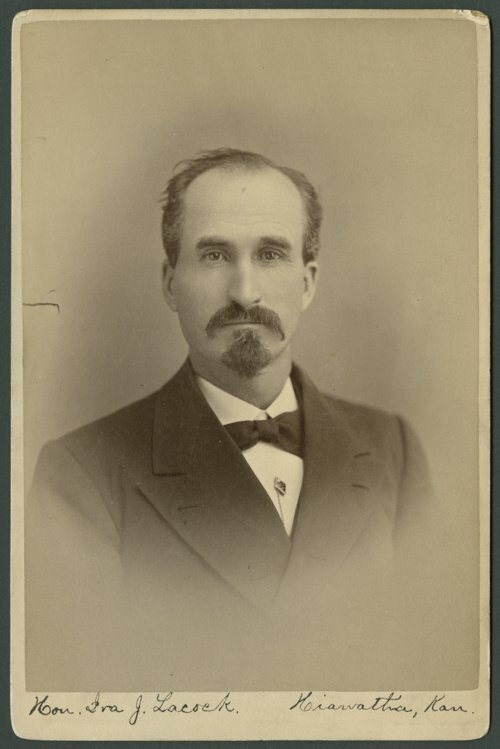 This cabinet card shows Ira J. Lacock (1831-1900), a lawyer from Hiawatha, Kansas. Lacock was a native of Washington County, Pennsylvania and graduated from Washington and Jefferson College in 1856 and later admitted to the bar in 1858. He moved in 1860 to Hiawatha, Kansas where he built a thriving law practice. During the Civil War, he organized and became captain of the Hiawatha Guards. This local militia attempted to join the First Kansas Infantry but later disbanded when their services were not needed. In 1862, he ran on the Republican ticket and was elected to the Kansas House of Representatives from the eleventh district. He was re-elected in 1863 and in 1865. At the start of Lancock's third term, his constituents asked that he resign for his failure to support a bill that allowed the railroad companies to obtain land that was originally entitled to the school district. On February 12, 1866, Lacock resigned his seat in the legislature and returned to Hiawatha. On August 16, 1866, he purchased the Union Sentinel newspaper. For a year he published and edited the paper before selling it on November 7, 1867. He was elected county attorney of Brown County in 1872, 1878, and 1888. For a number of years he also served as a Mason and master of Hiawatha Lodge, No. 35. On June 18, 1900 while addressing a meeting at the court house, Ira J. Lacock dropped to the floor dead at the age of sixty-nine.